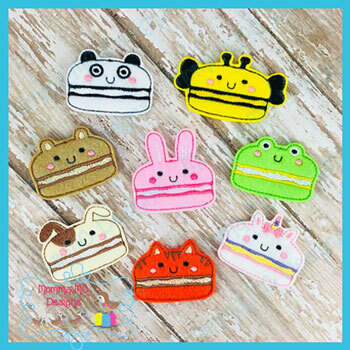 When purchasing this item, you will receive files for all EIGHT of the Animal Macaroon Felties as shown in the photo. NOTE: The animal macaroons in this series do not necessarily correspond with the 45mm and 50mm size designations. They were designed using the same size cookie so that the finished items will be proportional when stitching an entire set.